The most improtant forklift part for you to know something about is the forklift tire. Forklifts ride on tires and the number of tire options can be confusing. Selecting the correct tire can save you money and improve safety. There are typically three tire options and several sub-options within those options. 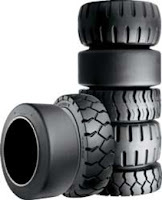 There are cushion tires, pneumatic tires, and caster tires. Today, we will discuss the Solid Cushion tires and why you would choose this option. Cushion tires are typically used on forklifts used indoors or on smooth concrete surfaces. They come in two basic configurations, smooth and traction. The traction tire option is a cushion tire that has a tread cut into it. They are best used in situations were the forklift may encounter some moisture and there for a little bit more bite is necessary for good traction. Smooth cushion tires are tires with a smooth surface and are built for long wear and stability. The outer surface is hard and designed to reduce cut and chipping and the inner material is built for greater cushion, hence the name. Forklifts are designed to use specific tires and hence the interchange of tires between lifts is not recommended. Cushion tire forklifts have lower clearance because the are designed to be used on very smooth and level surfaces, like a warehouse floor. As a result, these forklifts and tires do not do well outside for several reasons. The first is due to the fact that these lift trucks do not have a great deal of flex in the suspension and therefore if they encounter uneven ground it is possible to have one of the wheels come off the ground. If that wheel is your drive tire, you may find yourself stuck and need a push to get back to level ground. Another problem you may have with cushion tires is on asphalt. If you yard has fresh asphalt and it is a hot day, you may find that driving your cushion tire lift over your fresh asphalt may find your tires sinking in. These tires are very hard and they will leave an impression on your fresh asphalt. Why do users pick trucks with cushion tires. Again, there are several factors to consider. First of all they cushion tire forklifts are less costly than Pneumatic tire forklifts Second, cushion tires cost less and will out wear a pneumatic tire at least two to one. Finally, cushion tire forklifts are more stable that pneumatics because the are lower to the ground, which improve stability. It is important to pick the right tire for your business situation. Selecting the correct type will result in lower cost and less downtime for your lift. Our next post witll be on Pneumatic tires. So subscribe to this post to stay informed. Wow. I want to purchase this kind of tire. I think it is made in high quality material. I will check this out. Thank you for the information.